CATANAUAN, Quezon – About 61% of the total P3.7 billion worth of infrastructure projects allocated in Quezon province’ 3rd District has been disbursed in the Dept. of Public Works and Highways 3rd engineering district. This was disclosed by 3rd District Engineering Office (DEO) head Juanito Alamar saying his district’s accomplishment is No. 4 in disbursement in the entire Region 4-A Calabarzon (Cavite, Laguna, Batangas, Rizal, Quezon) region. “We have 84% actual ‘physical’ accomplishment in our District Engineering Office and we have exceeded the 80% target of the department,” said Alamar adding that the real indicator is really what you have disbursed on projects and not the so-called accomplishment. The reason he cited that only 61% has been disbursed on projects in his district included suspension, right of way issues, late release of funds and mobilization with regards to school building projects. 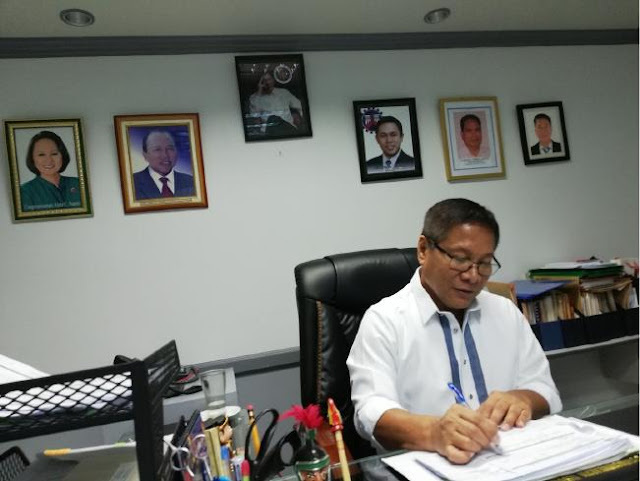 Alamar who assumed his post as head of 3rd DEO covering Bondoc Peninsula in 2017 said they are not worried with the non-approval yet of the new national annual budget as it would affect only new projects in the district. Among the 2018 big ticket ongoing regular infrastructure projects in the district included the San Francisco-San Andres-San Narciso road package 1 and 2 each worth P175 million; construction of breakwater in Bgy. Punta, Unisan, P150 million; construction of road in Bgy. Camflora in San Andres, P70 million, among many others. Rehabilitation and major repair of bridges included the retrofitting and strengthening of Macalelon bridge, P16.8 million; Catanauan bridge which services Gumaca-Pitogo-Mulanay-San Narciso road, P37 million; Kalilayan bridge in Padre Burgos- Pototanin Junction road, P50 million, among others. On the other hand the local infrastructure projects in the district included the construction of the P100 million Coconut Research and Development Center here; construction of multipurpose building (livestock and animal upgrade facility) in Unisan at P82 million; construction of water supply project in San Narciso at P58 million; construction of seawall and breakwater in Bgy. Sta Rosa, Mulanay at P40 million, among others. Bondoc Peninsula has a total of 346.3 kms. of national road which included Padre Burgos-Pototanin Junction road with 51.4 kms; Gumaca (Sisirin)-Pitogo-Mulanay-San Narciso road with 97.1 kms; Catanauan-Buenavista road with 29.7 kms; San Francisco-San Andres-San Narciso road with 51.5 kms, among others. Alamar said they have 84 regular and 87 office-based job-order employees in their district office distributed among various departments such as planning and design, construction, maintenance, quality assurance, administrative and finance along with their procurement and information and communication technology staff. Alamar said he believes that the accelerated ‘build-build-build’ infrastructure program under the administration of Pres. Rodrigo Duterte and being implemented by DPWH Sec. Mark Villar will help build faster many road projects which will go a long way to improve the people’s living condition in the provinces.